A bridge has existed in one form or another in the place known as "London Bridge", for nearly 2000 years. Originally it was constructed of wood by the Romans. But in 1136 the bridge was destroyed and a replacement one built, also of wood, in 1209 during the reign of King John. The New London Bridge was built of granite, from the designs of John Rennie and was completed in 1831, and cost £2,000,000. It connects the City with the Borough and the South of London. The traffic was enormous both for vehicles and pedestrians. Today the modern London Bridge is made of prestressed concrete box girders. It was designed by Mott, Hay and Anderson and was built by contractors John Mowlem and Co between 1967 to 1972. The bridge finally opened on March 17th 1973. Why go on a tour of London's attractions in person? 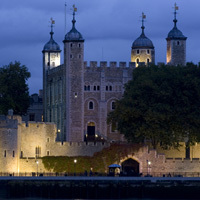 Discount tickets are available from our London Attractions page. The following articles about London Bridge give details of its history and legends associted with it.